Moving Guru » Moving Guide » Do I Need Climate-Controlled Storage? If you are storing perishables, then yes. 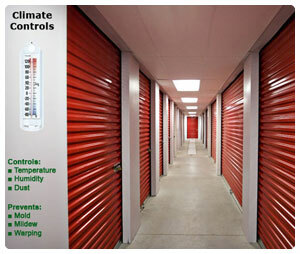 Climate-controlled storage units allow you to control the humidity and temperature levels in the storage unit. While this might not matter for, say, a plastic chair, it can be vital for a delicate woodwork or fabrics. Most self storage facilities raise their storage unit rates for climate control. You can expect to pay an extra $15 to $50 per month for climate-controlled storage units, depending on the size of the unit. Also, you might or might not be able to control the thermostat for the unit itself; the facility might do this. Check on the unit every couple of weeks to ensure it’s working as expected. Wood – Humidity can warp and rot wood. Paintings – If you have an expensive painting, make sure the paints used are heat and humidity resistant. Living things – Nothing living should be kept in storage, but if you need to store a plant for a week or so, make sure you have climate control.